Milwaukee has introduced a selection of new ‘Fuel 2′ power tools, delivering the latest innovations to popular M18 power tools. Purchase a Fuel 2 Kit and receive a cool Milwaukee Yamaha Jacket for free. The latest product innovations from Milwaukee have arrived in the form of the new Fuel 2 Combi Drill and Impact Driver kits, supplied in the practical Milwaukee Dyna Case with the all new M12-18FC Rapid Charger. 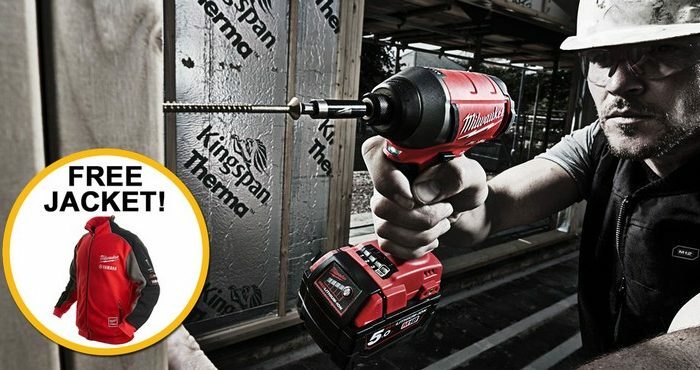 The M18 FID Impact Driver is also available as a body only (not part of the free Milwaukee Yamaha Jacket promotion), with the M18 FPD available in a twin pack. The primary upgrade of the new Combi Hammer Drill from Milwaukee is the improvement in performance, both in power and speed. The M18 FPD features unmatched torque of 135 Nm and in 2nd gear delivers speed of up to 2000 rpm, compacted into the smaller machine size of just 197mm in length. This is in addition to the Brushless Powerstate Motor and Redlink Plus intelligence system, making the Fuel 2 M18 FPD one of the leading Combi Hammer Drills available. The big upgrade to the M18 Impact Driver is the new Drive Control feature that maximises application versatility. Also featured on the new Fuel 2 Impact Wrench, available in the FPP2B-502X Twin Pack, Drive Control provides greater user control with speed and torque settings. Customers that purchase one of the Fuel 2 kits below will receive a free Milwaukee Yamaha zip-up Jacket, available in Medium, Large or Extra Large. The jackets will be sent separately from the order, arriving within 28 days of the order date.